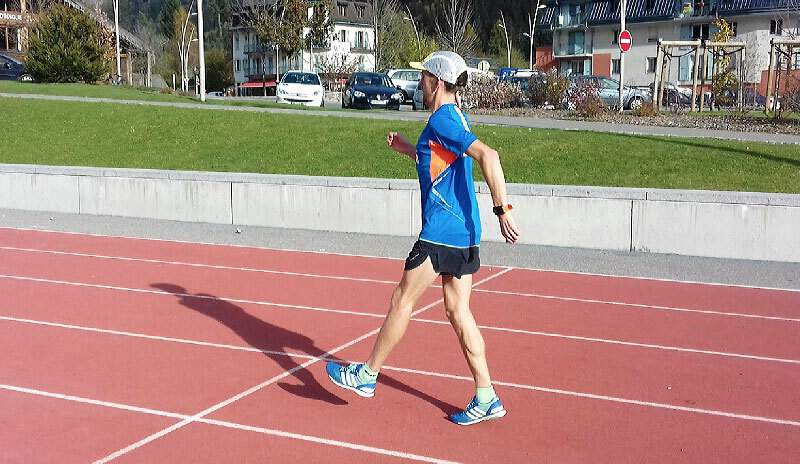 On the surface running is a pretty simple activity…put one foot in front of the other and just run. What could possibly go wrong? Not to be all doom and gloom, but clocking up the miles and session after session all adds up and the repetitive action on the body leads to an increased risk of injury. For any runner who has been injured, you know the dread associated with not being able to run. While there is no need to go and wrap yourself in cotton wool, it is important to understand that most injuries occur due to imbalances within the body. To counter this you need to make the body stronger and more efficient by targeting certain muscles and movement patterns with exercises. Exercises that offer functional benefits directly related to running are called drills. Compared to ‘normal’ exercises, drills are used to strengthen entire anatomical chains rather than isolate one muscle at a time. They ingrain patterns of movement that make your running more efficient and help address the imbalances that can lead to injury. Drills don’t have to take over your training regime. Often elite athletes will dedicate sessions only to drills, however, even adding a few easy moves to the beginning or end of your run a couple of times a week can help strengthen your running gait and reduce the risk of injuries. Some arguments point in favour of drills being carried out before a run as a warm-up routine. This is the ideal, especially if you have had an injury and you are just re-starting training as it warms up and activates the correct muscles and movements used while running. However, drills can also be implemented after a run. The benefit post run is that when fatigued, you are more likely to lose form and efficiency. Therefore implementing drills in this state can be more representative of a real-life situation when we could potentially get injured. Have you ever been nearing the end of a race and you notice your knee lift or stride length has dropped or your knees start knocking together? Twisted an ankle in the later stages of a hard run or race? This is exactly the point at which we need our new found strength come to the forefront. 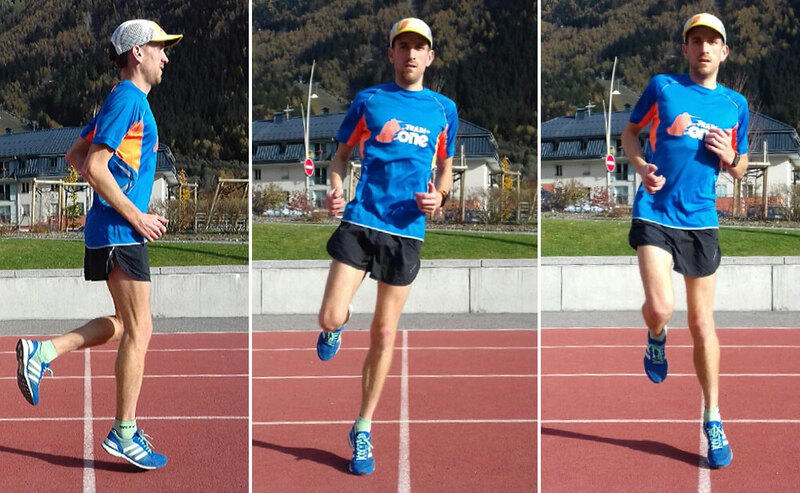 The below five key drills are beneficial to running economy and a good starting point for implementing drills into your routine. Ideally, they should be done on a smooth, flat surface. A track is ideal, but a driveway, garden path or a pavement (if you don’t mind some confused stares from passers-by) are all fine. When you start to get comfortable with these drills, you can progress to practising on a gentle slope or a hill. To begin with, start with only 2-3 minutes on each drill as you may feel some new aches or pains the day after and the emphasis on drills is on quality, not quantity. As you adapt to the new movements increase the time you spend on drills gradually. Running fast, up hills, downhills, through mud and when you start to fatigue all lead to reduced knee lift, which is essential to driving us forward. Strengthening this movement will help maintain your running form under fatigue. Looking straight ahead, imagine a string through the top of your skull to keep you tall and upright. Slowly walk through an exaggerated high knee movement. Keep your ankle and knee at 90 degrees as you lift the thigh perpendicular to the body. On the opposite, standing leg you should push strongly up onto your toes as the other leg lifts. Move the arms alternatively in a running action to make the move more functional and include the whole running action, keep the elbow at a 90-degree angle to also promote the best form. As you get stronger with this movement and it feels more natural, you can progress by adding more speed to the drill. Further down the line, you can introduce more of a skip action so that your stride becomes a bit longer and the movement more dynamic. The fatigue in hip flexors, coupled with a job (or commute) that entail a lot of sitting leads to your hamstrings, glutes and posterior chain becoming a bit dormant. This drill aims to strengthen that posterior chain by giving a “spring” like movement to help with power and propulsion off the ground. Again, standing up tall, this time take the leg out in front of you with a straight knee and as the foot lands the aim is to spring off the ground using the mid-foot. Start with small strides so that the spring action is enough to push the leg right back behind you. As you master this and feel the glutes and hamstrings working you can increase the stride length and/or pace of the drill. Always ensure your whole leg is moving behind you into extension as this will target the glutes more specifically. Foot function is imperative to reducing the stress of running on the body. The foot absorbs a lot of shock as the first point of contact, and the movement of pushing off the ground – all within a very short space of time. With the next drills, you are going to target more specifically the lower leg and foot strength. This drill is done at a slower pace and if your neighbours are really starting to think you are losing the plot, thankfully they can be done inside the confinements of your own home. Bare feet are an advantage with this drill because this engages the small, intrinsic muscles of the feet. Firstly ensure you have a tall, upright posture and keeping your knees straight rise up onto the balls of your feet. The big toe is a vital lever for pushing off the ground and actually directly influences the powerful gluteus maximus behind the hip. Ensure the ball of the big toe remains in contact with the floor on each move and the pressure is spread equally from left to right on each foot. Move forwards only pushing from the foot and ankle. As muscles work in pairs, the next move is counteracting the above and strengthening the muscles on the front of the shin. For anybody who has ever suffered from shin splints, you know how it feels for the poor muscles on the front to be bullied by the overactive and tight calf muscles behind. Stand up tall with your heels only in contact with the ground. At this point, it is very important to just check what your toes are doing. In order to cheat, people can often recruit all the tendons running along the top of the foot instead of the muscle in the shin. If all these tendons have started popping up and your toes are all lifted towards the leg try and relax them slightly whilst staying on your heels. With this drill, you should feel the front of the leg doing the work and not the top of the foot. At no point during the running gait cycle are both feet on the ground at the same time and the whole action can be broken down into a series of alternating hops. Hopping is essential and it helps improve the body’s balance and proprioception. 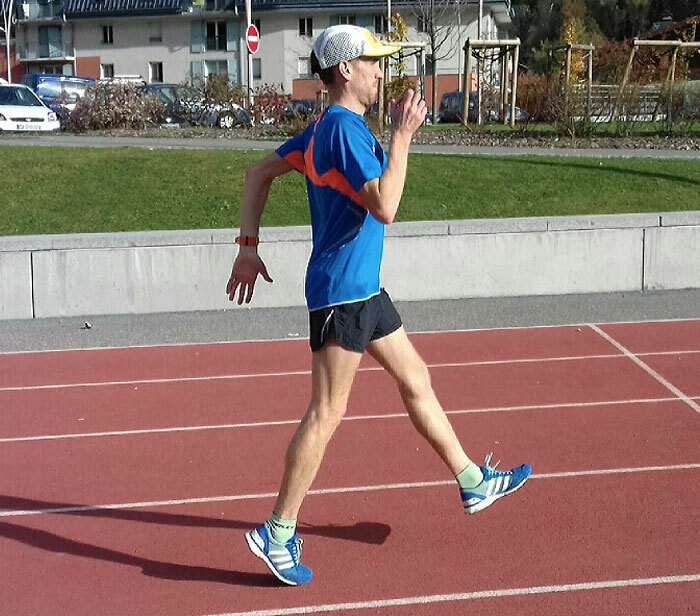 Also the stronger you are on one leg at any one time the longer you can maintain good running form without overloading other structures and because of this physiotherapists will often use hopping as a gauge for returning to running after an injury. The hopping drill is simple and with all the exercises discussed maintain good posture and keep the hips high. Choose a line or mark on the floor as a cue and hop forwards and backwards over this line. Maintain the good posture and next hop side to side over the line. Hopping can be progressed in a number of ways; introducing a hold after each hop sounds easy but if you hop forward and hold the landed position for five seconds, then hop backwards and do the same it really challenges your control, from the ankle all the way up to your core stability muscles of the trunk. 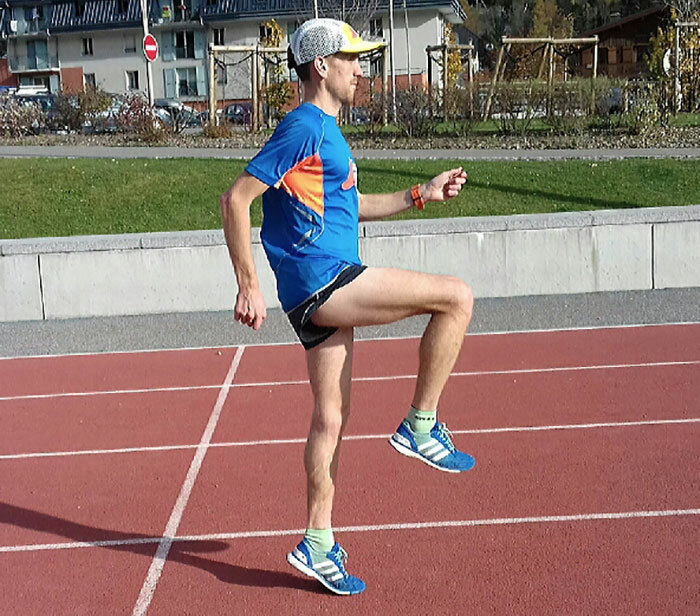 When you have mastered this drill, hopping up a small slope, on and off an uneven surface or even on and off a small step are all great progressions to really challenge all the simple movements that make up the running gait. Like stretching, core stability exercises and glute strengthening these drills can provide a useful adjunct to your training and help reduce the risk of injury in the long term. If you are already training specific muscles such as your glute strength, you don’t need to replace your isolated exercise routines but importantly drills help tie together the strength gains from exercises and activate the stronger muscles in a way that is functional to running. The expectation is not that you will start running like a model in a textbook, with a perfect running style. Who does!? However, if you can make your individual style even 1% more efficient that helps in reducing the likelihood of injury and a happier runner all around. Sarah Tunstall is a Chartered Physiotherapist and British international mountain runner.